Watchmaker Ulysse Nardin has unveiled a novelty Pride of Baltimore Limited Edition, named after the famous American caper’s ship whacked against the ships of Great Britain in the early nineteenth century. The novelty has become great addition to the Classico Cloisonné Collection with dials decorated with cloisonne enamel. The novelty is presented in two versions: in a case of 18K white gold (Ref. 8150-111-2/BALT) or 18K rose gold (Ref. 8156-111-2/BALT). The round polished case of the model, waterproof to 50 meters, has a diameter of 40 mm. 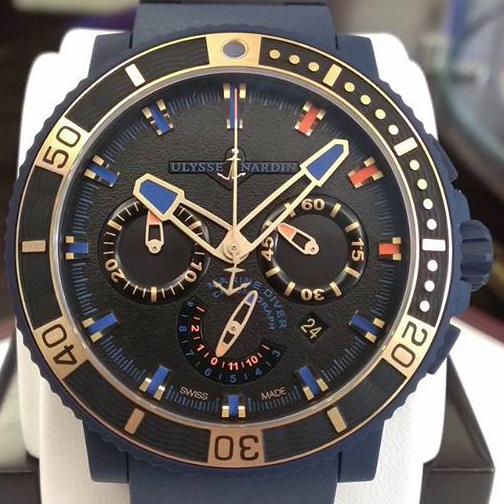 The fluted crown on the top is decorated with the Ulysse Nardin’s logo blue enamel insert. The case on both sides is equipped with an anti-reflective sapphire crystal. On the perfectly executed dial is located an art color image of the ship Pride of Baltimore, created in cloisonné. To create the image, the masters are used a miniature grid of golden thread with a length of 500 meters. The thickness of thread is no more hair. The grid is filled with colored enamel fragments, which create a pattern on the dial. The luxury dial features twelve round hour indexes in gold and central hands, the hour and minute of which are covered with white fluorescent compound. The model operates on the base of the manufacturing automatic movement Ulysse Nardin 815. The calibre provides a 42-hour power reserve and display functions of hours, minutes and seconds, and officially certified by COSC (Contrôle Officiel Suisse des Chronomètres) as a chronometer. An elegant brown leather strap with a gold buckle equips the novelty Pride of Baltimore Limited Edition, released in a limited quantity of 30 copies of each version. To buy the Pride of Baltimore Limited Edition watch is available through the official representatives of Ulysse Nardin.